ON 14 July 2015, FT Banana, the mascot of Fairtrade in Aberdeen City, will travel on the NorthLink Ferry to meet campaigners in Orkney, which is also a Fairtrade zone. An essential requirement for the city to retain its Fairtrade status is to appoint a flagship business that supports Fairtrade and undertakes to work in partnership with the city steering group. Appropriately, NorthLink Ferries have recently undertaken the role and they have proved that, as well as the usual tea, coffee, chocolate and sugar, they are able to do some thinking ‘outside the box’ where Fairtrade is concerned. Smart polo shirts – made of Fairtrade cotton from India – have been sourced for the crew and these will be introduced during FT Banana’s voyage. FT will be welcomed on arrival in Kirkwall by members of Orkney Fair Trade Group, will visit Northlink’s offices in Aberdeen and in Stromness, and enjoy an early morning cruise on the Hamnavoe to Scrabster and back. He will learn about Orkney Fair Trade Group’s ‘Buy Fair and Buy Local’ campaign, take time out for a coffee at Trenabie’s – one of Orkney’s favourite Fairtade cafés – and make a courtesy call to Orkney Islands Council. All of his exploits will be reported on Aberdeen Fairtrade’s Facebook Page and on his blog, ‘Fairtrade Odyssey’. Martin Rhodes, director of the Scottish Fair Trade Forum, said: “It is great to see different Fairtrade towns and zones working together and new links being established between them. - Aberdeen has been a Fairtrade City since 2004. 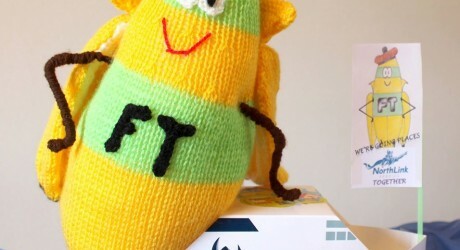 – FT Banana was designed as our mascot by local artist Andrew Smith and made into a knitted figure by Irene Parley. The Scottish Fair Trade Forum was founded in 2007 to help Scotland become one of the world’s first Fair Trade Nations, which was achieved in February 2013. Through its work with other Fair Trade bodies in the UK and beyond, the organisation engages directly with many Fair Trade groups, schools, universities, local authorities and others to support ongoing Fair Trade activity and encourage it to grow stronger. 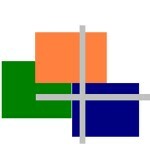 The Scottish Fair Trade Forum is a Scottish charity (SC039883) and a Scottish company (SC337384). Registered office: Robertson House, 152 Bath Street, Glasgow, G2 4TB. MEDIA RELEASE issued by the Scottish Fair Trade Forum. You too can post your story ideas for journalists (aka press or media releases), on allmediascotland.com. Email here for more information.